"The first question which the priest and the Levite asked was: "If I stop to help this man, what will happen to me?" But... the good Samaritan reversed the question: "If I do not stop to help this man, what will happen to him?" The Union Baptist Association (UBA) and First Southwest Baptist Church of Houston hosted and sponsored their first marriage retreat on Saturday, October 17, 2015. Eight couples from Region III Parole Division recently gathered at Trinity Pines Retreat Center for a day of encouragement and learning. TDCJ approved volunteers Rickie Bradshaw of the Union Baptist Association (UBA) and Pastor Charles Anderson of Epiphany Life Change Center graciously facilitated this marriage seminar. This year's Theme for the Marriage Retreat was titled, "Improve Your Marriage by Discovering the Key Relational Styles of Communication and Intimacy That Will Make Your Marriage Pop!" The marriage seminar included two workshops. The first workshop discussed intimacy and the second workshop focused on effective communication. The retreat included a nice lunch prepared by the Trinity Pine's Chef and participants had an opportunity for rest and relaxation to include a scenic tour of the grounds. The retreat ended in the beautiful prayer garden. TDCJ Region III Parole Chaplain Christina E. Thomas described the marriage retreat as a "Great success, and was a blessing to all in attendance." Volunteer Rickie Bradshaw enthusiastically expressed, "Wow! What a great day of faith and fun. 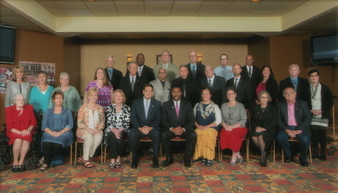 It was both a pleasure and honor to conduct the Marriage Retreat for the Region III Parole Division!" The UBA is a strong supporter of the TDCJ mission. They currently provide Organic House Church Training and Life Change Group Training and Facilitation at the following units: Carol Vance, Jester III, Wynne, Darrington, Terrell Units and the Region III Parole Division Houston Seven District Reentry Center. UBA is an association of over 560 affiliated congregations, primarily but not exclusively from the greater Houston area, cooperating for the purposes of missions, evangelism, leadership development, church planting & discipleship. The Houston metropolitan area is the 5th largest in the U.S., is the most ethnically and culturally diverse metro area, and leads the nation in population growth. To learn more about the Union Baptist Association. This story is about two individuals on separate paths that converged into one. Rito and Jim became friends in 1993 through their volunteer service with the Correctional Facilities Committee. They shared a willingness to make a difference in the lives of those incarcerated. Jim became Rito's mentor and they still continue with their relationship, lasting over 23 years. 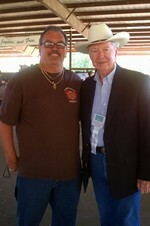 Jim Estelle is a former director of the Texas Department of Corrections. 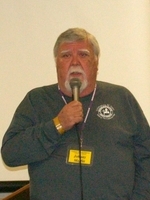 He has been involved with Alcoholic Anonymous (AA) community for over 35 years. He served as Class A (non-alcoholic) Trustee on the AA General Service Board 1977 to 1986, and was elected Chairman of the Board 1993 to 1997. Rito V. is a volunteer working in the area of substance abuse. He started volunteering throughout the TDCJ in 1994. In his 22 years of volunteering, Rito has visited 36 facilities in the TDCJ to share his story of hope. At one time, Rito was a convicted felon in the TDCJ. While he was incarcerated he was introduced to the 12 Step Program. Rito is a Certified Criminal Justice Addiction Professional and International Certified Chemical Dependency Counselor with United States Veterans Initiative. Rito continues his volunteer service in carrying the message of hope inside the TDCJ. Jim and Rito have spoken internationally together at conferences. They share their personal experiences, strength and hope with volunteers and professionals. This is an outstanding example of restorative justice and giving back to the great State of Texas. The Segovia Chaplaincy department is proud to have CVCA Bev D. from Parry Sound, Ontario Canada. Bev is engaged in prison ministry in both countries and brings a wealth of wisdom and enthusiasm to the Segovia Unit. 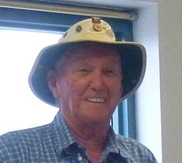 Bev became involved in prison ministry through his dedication to the 12 step program that has led him to 58 years of sobriety during his 61 years of marriage. He shares experiences from the Canadian Merchant Marine to the corporate business world. Bev possesses a great deal of practical knowledge, as well as, heart for the incarcerated and those who struggle with addiction. Bev believes in the good in people, the power of a 12 step program and the love of God as foundation for his life and his love for others. As a CVCA, Bev is active in the Chaplaincy department in the Choir practice, Chaplains Videos Service, Faith Based Dorm and facilitates AA meetings and assorted interactive classes. Having been a Christian since his early childhood, Bev has been raised with an attitude of giving to and loving on those in need. He firmly believes in pouring what God has given him into the lives of others. He exemplifies his personal mantra, "I embrace the people in my life and I freely give back what has been freely given to me." "A volunteer is a person who can see what others cannot see; who can feel what most do not feel. Often, such gifted persons do not think of themselves as volunteers, but as citizens - citizens in the fullest sense: partners in civilization." Dr. 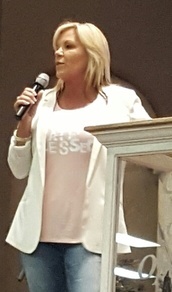 Dawn Knighton founder of Radical Restoration Ministries from Ormond Beach, Florida traveled to Texas to speak at the Coalition of Prison Evangelists (COPE) South Central Conference. Dawn is an ex-felon that has been restored and is ministering to individuals around the United States. Dawn visited several TDCJ facilities to share her testimony. If you want to read more about Dawn Knighton check out her Website. Radical Restoration Ministries. Roy E, Chaplain Knapp, Cassaundra H., Richard D.
I would like to share from my heart. Since 1997, I have been a strong supporter of the concept of restorative justice. It is important to me for everyone to know that although my career is as a justice professional, I also volunteer within the prison system. My journey began while employed with the Ohio Department of Rehabilitation and Corrections. With the support of my wife, we volunteer in the TDCJ giving back as a stakeholder in the restorative justice concept. Restorative Justice is composed of four stakeholders: victims, communities, justice professionals and offenders. The principles of Restorative Justice are a way of viewing, understanding, and responding to crime and its effects on society. Crime is recognized as harm done to an individual or the community, not the state. Crime is more than lawbreaking, it causes harm to all stakeholders. The offense is viewed as a violation of people and relationships. My wife and I met a couple, Greg and Melissa, through Worldwide Voice in the Wilderness while volunteering for an offender marriage seminar. A year later Greg and I met for lunch. I inquired if he would allow me to share his powerful story of hope that encompasses the true meaning of restorative justice. The story that you are about to read next touched my heart and I want to share it with you. 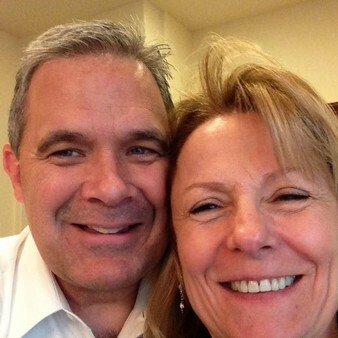 This is Greg and Melissa's story told by Greg, which he titled: "Surrounded by Hope." Recently I spent an afternoon with a fellow volunteer. It was nice to catch up on the latest news from both our lives and to touch base concerning our future activities. During the discussion I realized just how blessed I am to now be in a position to give back after having been the recipient for many years of the time, energy and efforts of TDCJ volunteers. I also had one of those "light bulb" moments when I thought back to all the ways my life has been impacted by the care and compassion of so many people, without them knowing the magnitude. Let me try to explain. I entered the TDCJ on May 1, 1987 after spending the previous year in a county facility. I had left behind a trail of anquish and dispair for many others and was beginning the sentence of life imprisonment at the Coffield Unit. For my wife and I, this was a time of much uncertainty and confusion. We began our new start as our lives were being affected by a God we had never known before. He made himself known to us through the words and deeds of many different people - most of whom we had never met. As I look back to those early years at the Coffield Unit I recall the smiling face of a certain TDCJ officer. He was a kind and compassionate man that will remain nameless. He was a stickler for the rules, however I will always view him as an angel from heaven. When I met him he was on second shift and worked hard to pass out mail the moment it arrived on the cell block. I think what impacted my life the most, and why I have such powerful memories of my interactions with him, is due to his acknowledging that I had left a loved one behind. I was doing life and he just seemed to understand. He always offered a word of encouragement and a gentle reminder that someone still needed my love and my focus back home. In a very unique way, his presence surrounded my life with hope. Within a year or two of arriving at the Coffield Unit, I began to hear of a new program that was coming to the unit. It was a marriage seminar and it was being sponsored by Texans Do Care Ministries. The founders of the ministry, Ed and Ardith Williamson, had a firm belief that families were important, especially those touched by incarceration. The debt and gratitude that my wife and I have for Ed and Ardith can never be fully expressed. I will simply say, that Melissa and I sponsor marriage seminars today because of how important they were to us during my incarceration. Looking back to those early seminars, I also have a deep sense of gratitude for Chaplains Jerry Groom and Mark Pickett. They, too, believed in family and ensured these cutting edge programs were allowed to grow and prosper, even at an institution with the reputation of the Coffield Unit. As I look back at the young couple we were - trying our best to hold together a marriage, despite the odds, I am reminded of how much our chaplains surrounded our lives and our marriage with hope. As the years continued, I was transferred to the Stiles Unit. This was a new facility at the time and was located a mere ten minutes from my wife's apartment. Needless to say, it was a gift to have the opportunity to visit each week and to have our letters (snail mail) processed within days of each other. I would spend fourteen years there in Beaumont before transferring out to pre-release in 2007. I cannot adequately express how important those years were to my wife and I. I spent years growing spiritually and emotionally through programming. I was surrounded by staff and volunteers who cared not only about my life and future, but also challenged me as I dealt with so many issues that had been ingrained from my youth. The respect that was given to my wife during those years at the Stiles Unit, has left a lasting impression of honor. The number of security personnel who exhibited respect and dignity toward her far exceeded those who did not. I do not recall a single day when comments were taken in a negative context by my wife. In fact, we were continuously encouraged by the staff and constantly reminded that life was too precious not to live for the moment. It seemed as though God surrounded our lives individually, and as a couple, with hope during those years at the Stiles Unit. It has been eight years since the gate at the Huntsville Unit (the Walls) opened and I was granted the opportunity to live in the free world again. Daily, I cherish the moments God gives to us. We will not forget how much our lives and our marriage have been touched by others. We will spend the rest of our lives giving back what was so sacrificially given to us. We will never forget that our lives are always surrounded by hope - even out here. Though you may not see the immediate effects of your efforts, be assured that your labor is not in vain. I truly hope this story has warmed your heart as it did mine. This is only one of many stories. I know that each of you has a story that has changed many lives in the TDCJ. Volunteers share a special place in my heart and know that you do make a difference. Author Sherry Anderson said it best when she said, "Volunteers don't get paid, not because they're worthless, but because they're priceless. " I look forward to sharing many more stories "From the Desk of the Volunteers Services Director." These stories will revolve around restorative justice and the great works that volunteers do in the TDCJ throughout Texas. Congratulations To Our Governor's Criminal Justice Volunteer Service Award Recipients! The Governor's Criminal Justice Volunteer Service Awards are a collaborative effort between the Office of Governor Greg Abbott and the Texas Board of Criminal Justice (TBCJ). These awards are designated to honor volunteers who have made an outstanding contribution to the mission of the Texas Department of Criminal Justice (TDCJ) to provide public safety, promote positive change in behavior, reintegrate offenders into society, and assist victims of crime. This presentation has become a time honored tradition and a highlight for the TBCJ and the TDCJ. The awards were presented by TBCJ Chairman Honorable Dale Wainwright, and TDCJ Executive Director Brad Livingston during a ceremony held in Austin on April 15, 2016. "Volunteering is not a choice for the men and women being recognized today," said Wainwright. "They see it as a responsibility and for that we're thankful." Read more about this years recipients. Volunteer Services wishes to congratulate Carolyn Moye and Rita Alexander on their 20th anniversary volunteering at the Plane State Jail. In 1996, Volunteer Carolyn Moye asked the Lord to help her retire so she could go into ministry full time. Her prayer request was answered in June of 1996. Carolyn started ministering with Women Aglow and provided quilts through her craft program at Plane state Jail for babies born HIV positive. Twenty years later, Carolyn and her good friend Rita are still making craft items with the women at the Plane State Jail. They have expanded to making toys for underprivileged children in orphanages and ministries. 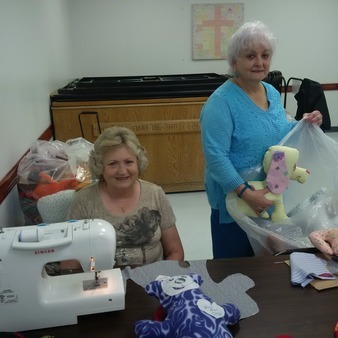 They also crochet and knit items for elderly shut-ins and those in nursing homes. Their unique ministry includes encouraging the ladies through prayer and counseling. "Many have come to the saving knowledge of Jesus," Carolyn states. "We love what we do, especially giving toys to several hundred children every year." Volunteer service can be contagious. Randy, Carolyn's husband, started volunteering with her three short years later providing religious programing on the unit. Randy and Carolyn facilitate a program entitled "Making Peace With Your Past. " They also assist by providing church services in the unit. To learn more about becoming a TDCJ volunteer visit the TDCJ website and click on the Unit Directory to identify a facility near you. If you would like to discuss the specific volunteer needs for the facility, please feel free to contact the Unit Administration or the Chaplain by calling the facility. You can also visit the Volunteer Services webpage by clicking on Volunteer with the TDCJ. You are encouraged to complete a Volunteer Application and take the application to a Volunteer Training/Orientation class near you.